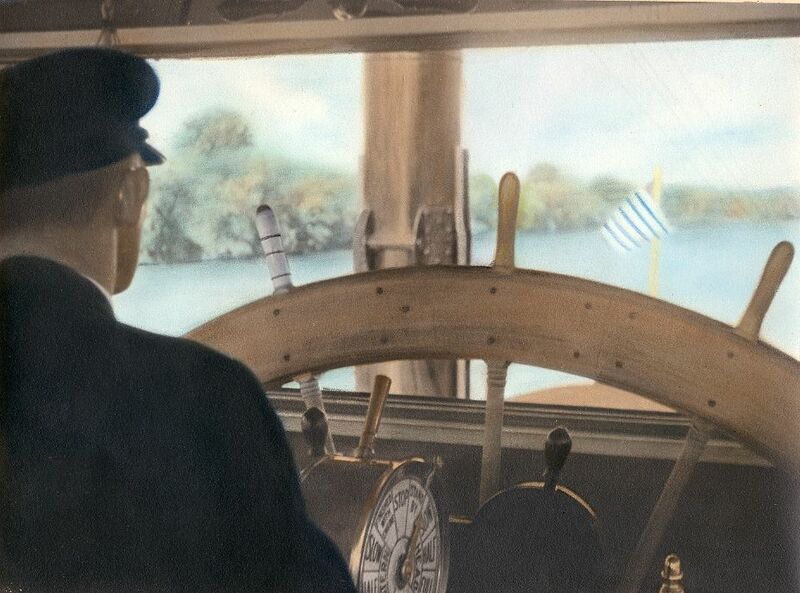 Full view and close up of the Gordon C. Greene June 1942 approaching the TVA Wilson Dam in Alabama Arthur Rothstein. I retrofitted the steamboat with tall stacks and a larger pilot house to give it a vintage appearance. After over an hour fiddling with the original 8 x 10 print which was cut and pasted around the top of the rigging in the highest area above with glue residue discoloring the rigging and the sky I managed to clean up the image fairly well. The lettering on the starboard bow was crudely hand painted in so I generated a new line of type, scanned it and reversed it from white on black to white on black, spaced the letters far enough apart to look reasonable and here we are with the GORDON C. GREENE which looks like it's a wharf on the Mississippi at New Orleans, Louisiana now, print not dated but probably taken in the late 1940's. This photo was one of Fred Way's favorites and he used it on the cover of the Dec. 1990 Reflector. I got the original photo from a dealer out here, had Ralph DuPae copy it and got prints made for Fred and others. Photographer was Paul Briol. Tom Greene set him ashore from the Gordon C. Greene then steamed away up river at Pipe Creek. Fred didn't say what year it was or where on the Ohio River that Pipe Creek is located. I would guess the 1940's. Fred recollected that the Captain put the photographer ashore at the foot of a hill that the man climbed with his camera and took some photo of the GORDON C. GREENE steaming off with lots of black smoke rising from its stacks. Then the Captain turned the boat around and retrieved the photographer after he had climbed down the hill. Fred mentioned the location on the Ohio River where this was taken and if and when. The credit on the back of the picture was given to Henry Flannery of 402 Battery Street San Francisco. but the caption is corrected by Fred Way himself in The Reflector, Vol. 27, No. 4 December 1990, p. 19. "The GORDON C. GREENE wending her way up the Ohio River. This photo portrait was recently found by Dave Thomson who sent it to Ralph DuPae for inclusion in the University of Wisconsin's collection in the Murphy Library at La Crosse. The original was made from an 8x10 glass plate negative taken by the late Paul Briol of Cincinnati. Capt. Tom Greene set Paul ashore with camera and tripod, then staged a "pass by" with coal smoke billowing, upbound at Pipe Creek. 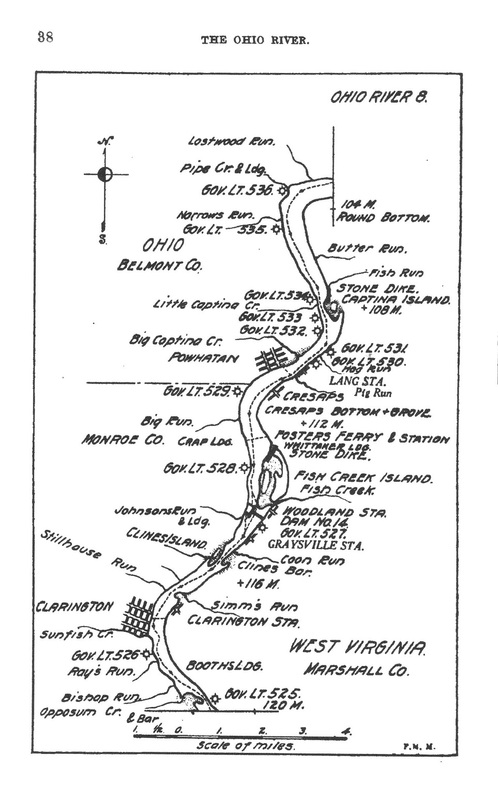 Editor's note: Our thanks to Sharon Cunningham for sending this Ohio River map from the Corps of Engineers, 1923, showing Pipe Creek and Landing on the right bank downbound at the top of the page. Another Greene line boat, the CHRIS GREENE is directly behind Captain Tom Greene and the painter. Michael Blaser pointed out to me that the boat on the far left was the last ISLAND QUEEN whose fuel tanks exploded at Pittsburgh on September 9th, 1947 (the year after this photo was taken) which resulted in the the loss of 19 lives. Captain Ernest Wagner barely escaped with his life. GROOMING HER FOR THE 1946 SEASON CAPT. TOM GREENE, RIGHT, CHATS WITH A PAINTER DURING THE SPRING CLEANING OF THE GORDON. C. GREENE, THE ONLY TOURIST EXCURSION BOAT IN SERVICE ON THE MISSISSIPPI RIVER SYSTEM, AT CINCINNATI. SEVENTY YEARS AGO THERE WERE NEARLY 6,000 SUCH STEAMERS. CAPT. GREENE IS THE 33-YEAR-OLD PRESIDENT OF GREENE LINE, INC., WHICH OPERATES TWO OHIO RIVER PACKETS IN ADDITION TO THE GORDON C. GREENE. Compiled from old La Crosse newspapers, this popular book brings together over 200 interesting, unusual and bizarre stories from La Crosse's past not deemed suitable for a general history book about the city. The chapter topics are animal kingdom, children, domestic disasters, fun & games, ghosts, grief & sorrow, naughty folks, odds & ends, transportation, weather. Unusual hand tinted photographic print mounted on a card with the studio name "Vogue" written in pencil below. on the "Gordon C. Greene"
Barely legible rubber stamp Vogue Studio - Peoria, Illinois. 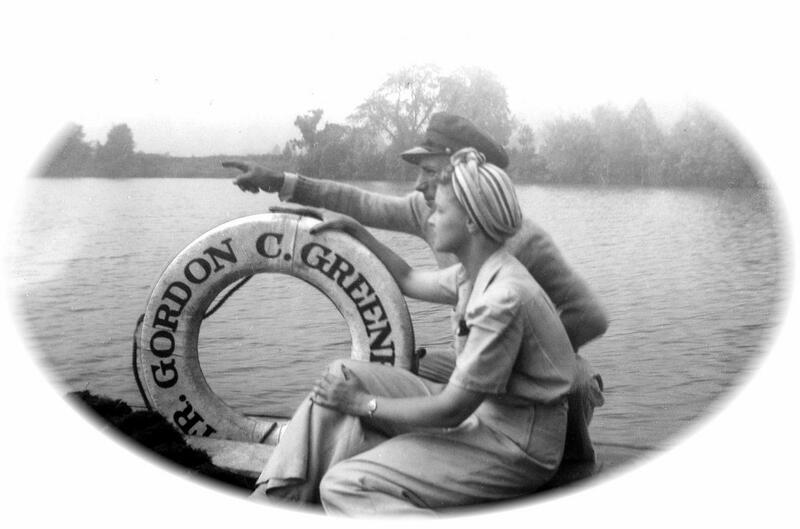 Gordon C. Greene life preverver and couple; a late 30's early 40's Rhett and Scarlett. Above is a nice sharp photo of the interior of the cabin on the GORDON C. GREENE. Am not certain if sprinkler systems had been developed to extinguish fires back when this photo was taken but if they were, that could explain the exposed plumbing running through the arches on both sides of the cabin. If it wasn't a sprinkler system it could have been plumbing that fed water to the bathrooms on the passenger deck. The GREENE's overnight passenger service began in 1935 and ended in 1951. 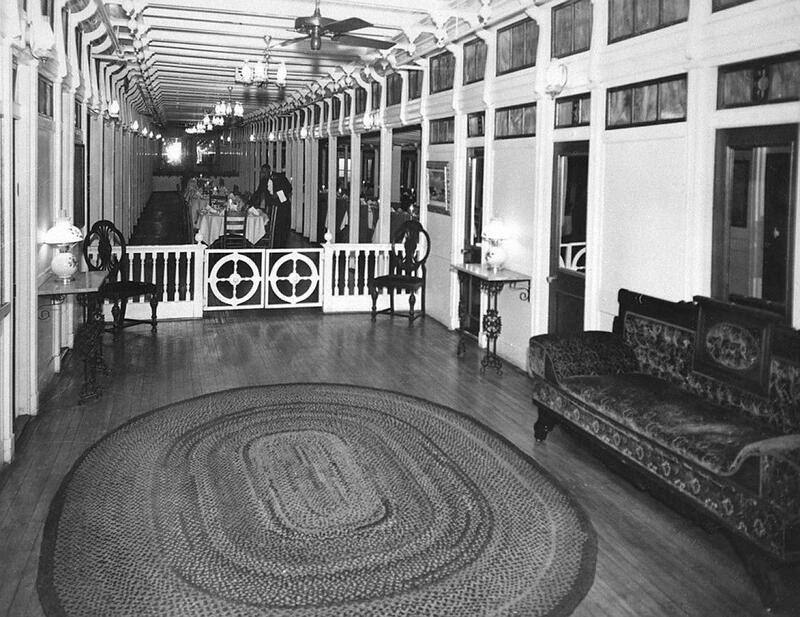 This black and white image from La Crosse shows some stateroom doors and transoms with skylights overhead between the arches remain on the right which was apparently designated as a reception area for diners waiting to be seated. 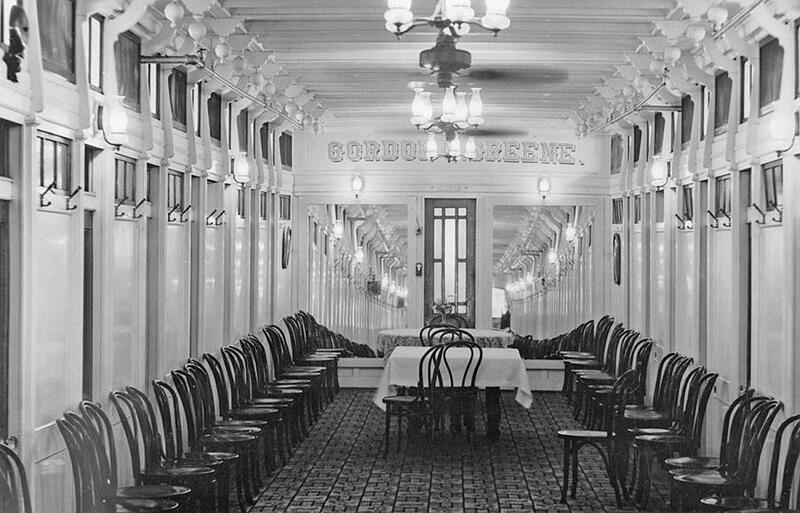 Additional space occupied by tables for diners was provided by removing many of the original staterooms and expanding the square footage out beyond where the port and starboard bulkheads had been and beyond into what was the outer gallery of the steamboat. "LED BY MRS. C. E. BOWER OF YORK, PENNSYLVANIA., FOREGROUND, A GROUP OF WOMEN PASSENGERS ABOARD THE GORDON C. GREENE, OHIO-MISSISSIPPI RIVER CRUISE BOAT, ENJOY A BRISK EARLY MORNING WALK AROUND THE UPPER DECK OF THE VESSEL AS IT SAILS DOWNSTREAM." 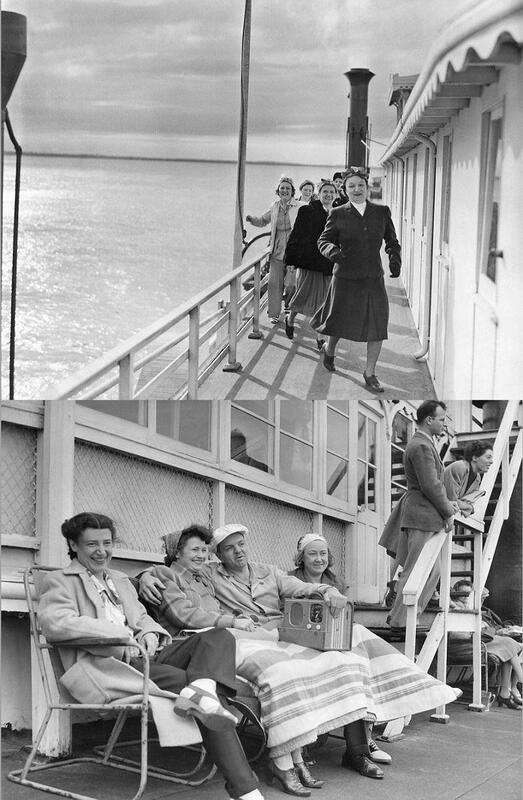 THERE WAS NO CAPTION ON THE BACK OF THE SECOND PHOTO WITH THE 4 CONTENTED FOLKS IN DECK CHAIRS AND THE 2 FOLKS ON THE STAIRS, WHO WERE ALL ON THE SAME CRUISE AS MRS. BOWER AND HER FRIENDS. 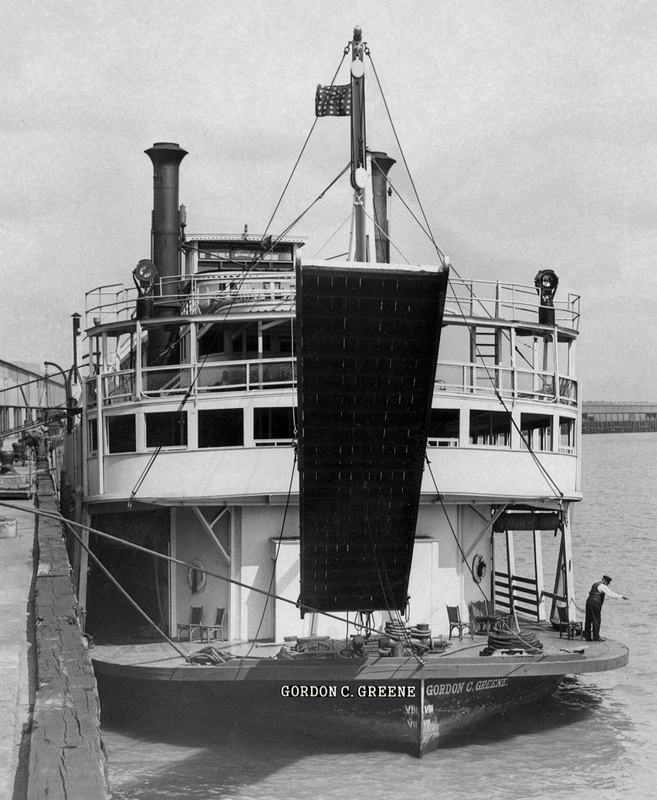 Gordon C. Greene was a paddle steamer, launched in 1923, that operated under several names before sinking in St. Louis in 1967. Built by the Howard Ship Yards & Dock Company at Jeffersonville, Indiana, for the Eagle Packet Company as the Cape Giradeau. 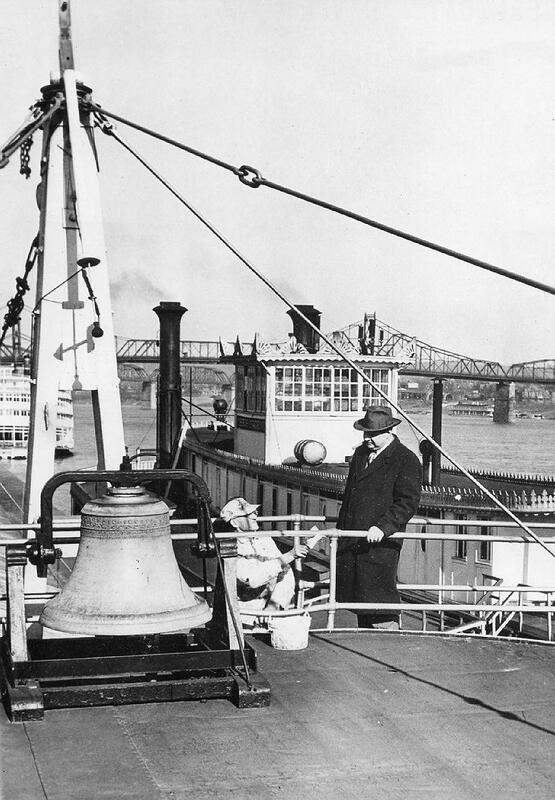 She was engaged in the packet trade, initially carrying passengers and freight between Louisville, Kentucky and St. Louis, Missouri, with annual trips to New Orleans for Mardi Gras. 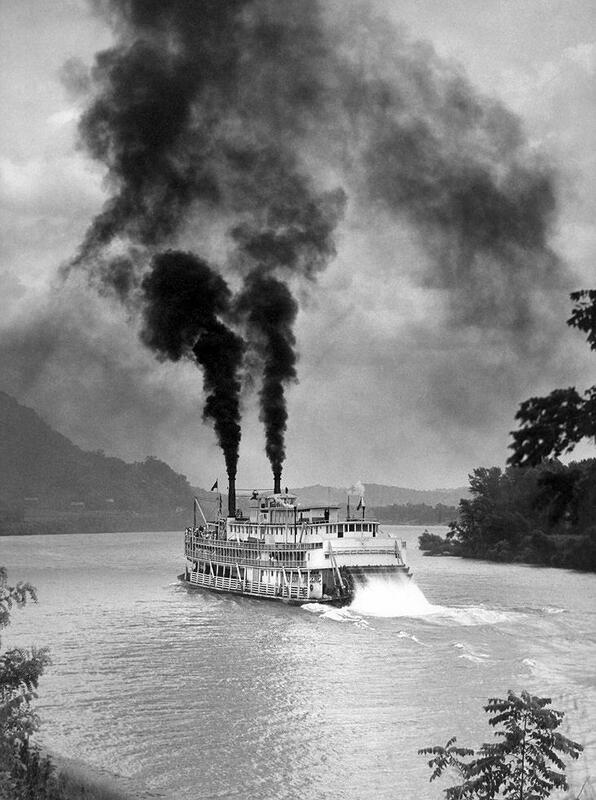 In 1935 she was sold to Greene Line for $50,000, and renamed Gordon C. Greene, after the founder of the company, to operate as a tourist boat on the Ohio River between Pittsburgh and Cincinnati, while still often making her annual trips to New Orleans. In 1936 her Captain, Thomas R. Greene added an extra "sun deck", increasing the number of passenger cabins, and she was later converted from coal to oil fuel. However, as time went on the boat suffered a series of mechanical breakdowns and was eventually withdrawn from service in 1951. In 1952 she was sold, and then passed through a series of owners, none of whom seemed able to make her a profitable concern. First, under the name Sara Lee, she was converted to a floating hotel at Portsmouth, Ohio. 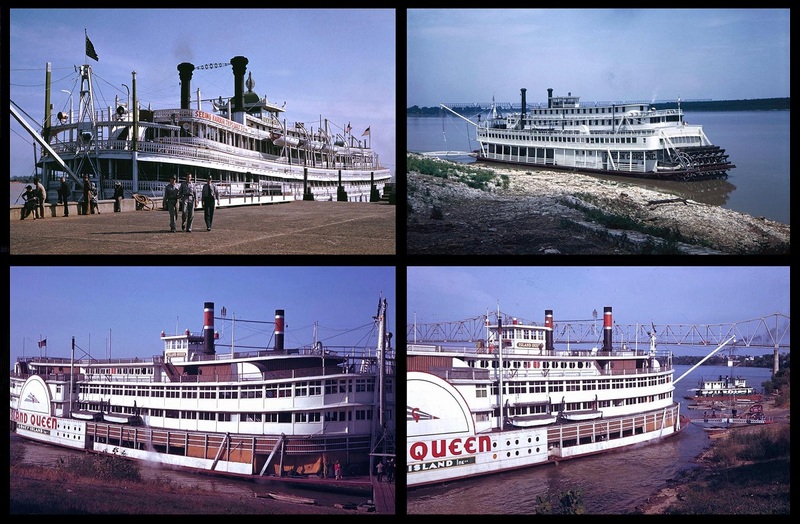 Soon afterwards she was renamed River Queen to serve as a floating restaurant at Owensboro, Kentucky, and was later fitted out as a tourist attraction at Bradenton, Florida. In 1954 her boilers were removed and were fitted into the steamboat Avalon (now the Belle of Louisville). In 1960 she was towed to New Orleans to be converted to a night club, but was soon at Hannibal, Missouri, serving as a restaurant. In 1964 she was sold for the last time, and was based at St. Louis as a bar and restaurant. There, on the morning of 3 December 1967, the River Queen sank at her moorings. I found this photo back in the late 1990's in an antique store at Springfield, Illinois (Abe Lincoln's town) 100 miles east of Hannibal, Missouri. 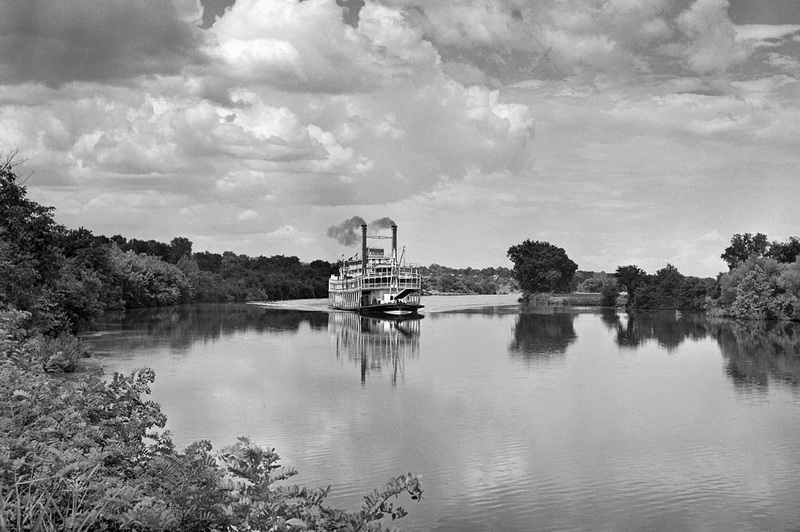 At the bottom of the picture is the former GORDON C. GREENE renamed the RIVER QUEEN, moored as a tourist attraction along the Illinois shore of the Mississippi River just north of the first Mark Twain Memorial Bridge (dedicated by FDR in 1936) with Hannibal, the boyhood home of Sam Clemens, Hannibal just opposite on the Missouri side of the river. The photo was a timely discovery since it would be included in a book that local historians Hurley and Roberta Hagood were then writing entitled HANNIBAL BRIDGES THE MISSISSIPPI which gave the history of the spanning of the river at Hannibal, first by the railroad bridge further up the river in 1869 and then by the new deluxe Mark Twain Memorial highway bridge located a relatively short distance north of this location and replacing this old worn out two lane bridge in 2000. A composite of four color slides taken by Charles W. Cushman during the 40s. Indiana University's Digital Library Program and the Indiana University Archives invite you to explore what Cushman saw. Here you can view his photographs as well as read contextual information about Cushman's life and work. 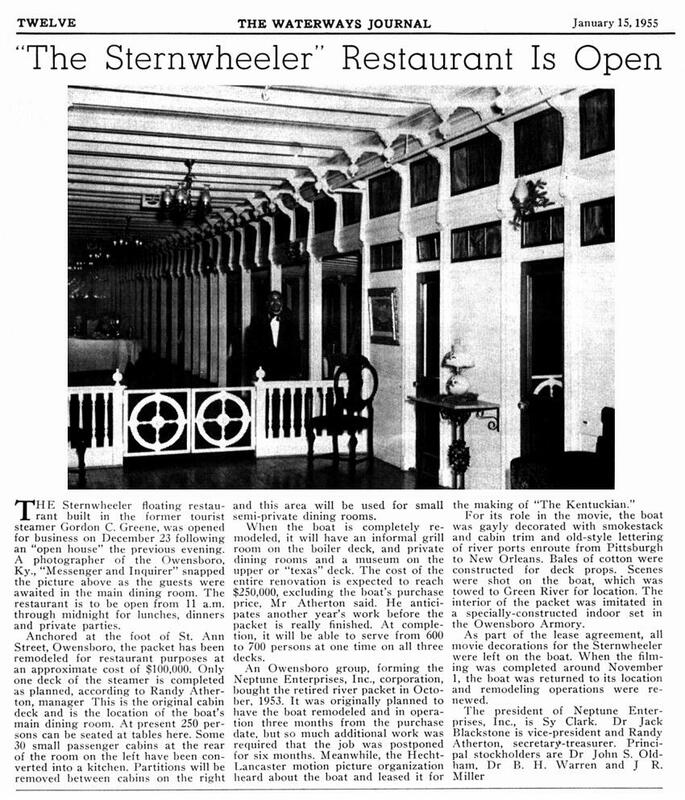 This is especially interesting because it not only tells of the opening of THE STERNWHEELER restaurant on the retired GORDON C. GREENE at Owensboro, Kentucky but it mentions the use of the boat in Burt Lancaster's feature film THE KENTUCKIAN in which stills from the movie show the name STERNWHEELER on the boat which was apparently because the word had already been painted on it because that was to be the name of the restaurant which would soon open on board. Of particular interest is the revelation that the interior of the cabin of the GORDON C. GREENE (for the gambling sequence on board in the movie) was replicated on an indoor set in the Owensboro Armory. It would be interesting to know if any of that set survived and was utilized by anyone in Owensboro for interior décor somewhere in town. 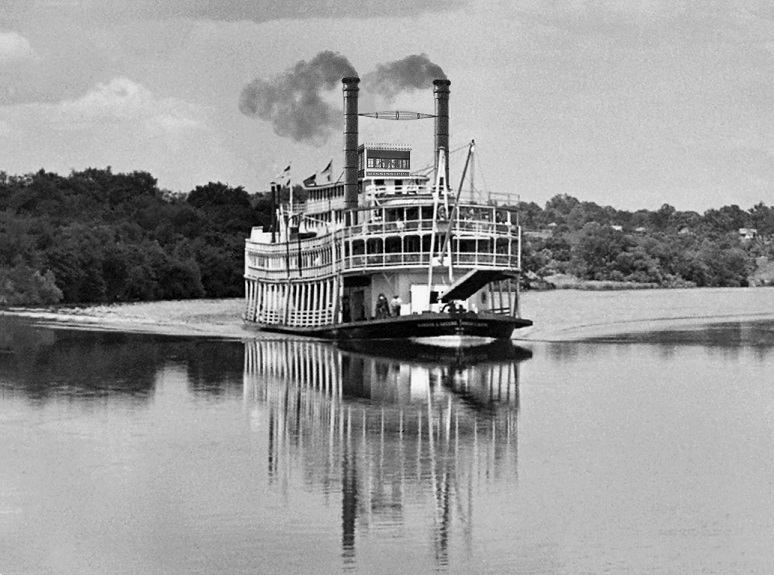 The décor on the boat itself that was added by the Art Directors for THE KENTUCKIAN were left on board after completion of shooting the film as part of the lease contract which must have served the boat well when it later was renamed the RIVER QUEEN. "For your entertainment WSM TV and WSM Home of the 'Grand Ole Opry'." 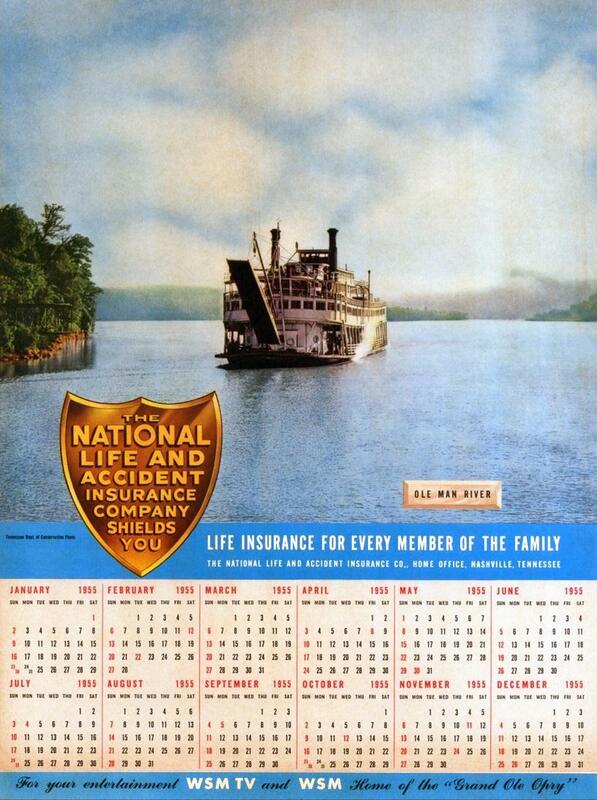 This calendar would have been given to subscribers by National Life and perhaps advertised on the Opry as a free offer to listeners who wrote in to WSM to request one of these as a complimentary promotional item.